In the telling and retelling of his thought experiment, a scientific legend was born. The legend of Schrödinger’s cat: wanted—but never found—dead and alive. It fascinates me to consider the extent to which the paradox of Schrödinger’s cat lives on. The problem isn’t with the idea of a paradox, or the underlying science, it is with the story itself and how it is told. There’s a cat confined in a box with a deadly device that, if triggered, will kill the cat. The trigger, in turn, is wired to a detector surrounding a few radioactive atoms. If any one of the radioactive atoms decays, a particle will escape the atom, hit the detector and in turn trigger the mechanism that kills the cat. If no atom decays, the cat remains alive. Now, it has been experimentally demonstrated that if radioactive atoms are left unobserved, they can enter a state of superposition—that is, simultaneously decayed and not decayed. If this is the case then it must mean that the detector has simultaneously been hit by a particle and not hit by a particle. It then follows that the mechanism has been tripped and not tripped, leading to the conclusion that the cat must be dead and alive at the same time. But it is also known that a superposition cannot be directly observed. Any attempt to observe the state of the cat will result in only finding one definite state. The dead-alive state “collapses” as soon as anyone looks inside the box; the cat instantly becomes dead or alive. It’s dead and alive so long as you don’t look in the box. It’s not the poison that ultimately kill’s the cat—it’s you looking into the box. Your curiosity kills the cat! For Schrödinger it was irrelevant whether a real cat would live, die, or do both. It was an experiment never to be conducted on anyone’s cat except his imagined one. Thought experiments, including Schrödinger’s cat, serve important functions in theoretical science without ever being conducted in a laboratory. This differs from proposing a new scientific theory which, to gain credibility, requires confirmation by real experiments. One of the most important functions of thought experiments is to expose unresolved problems in existing theory. They are efficient at zeroing in on a specific aspect of a theory without having to deal with the practical difficulties and limitations that occur with live experiments. A scientist can invoke or loosen constraints impossible for a scientist to reliably control in a laboratory. Schrödinger was thus able to imagine sealing a cat in a box for an hour without regard to the moral or practical implications of doing so. The cat was no more than a mental placeholder representing something made up of billions upon billions of atoms that together form an object, or better yet a pattern of energy, that we can see with our eyes, and which we perceive as existing in one of two mutually exclusive states: dead or alive. The cat was an amusing shortcut for representing a large complex system of interconnected particles. Schrödinger’s cat is still used today in scientific literature to symbolize any system that can be put into superposition. That is, put into multiple contradictory states at the same time such as up and down, on and off, here and there, right and left, etc. But even with access to today’s technology, one of the largest Schrödinger “cats” demonstrated so far has been a single fullerene molecule made up of seventy carbon atoms. And, it only existed in a combination of mutually exclusive states for about a millionth of a second. Even so, Schrödinger’s cat continues to be invoked in ways that further the legend more than the underlying science. One can even set up quite ridiculous cases. 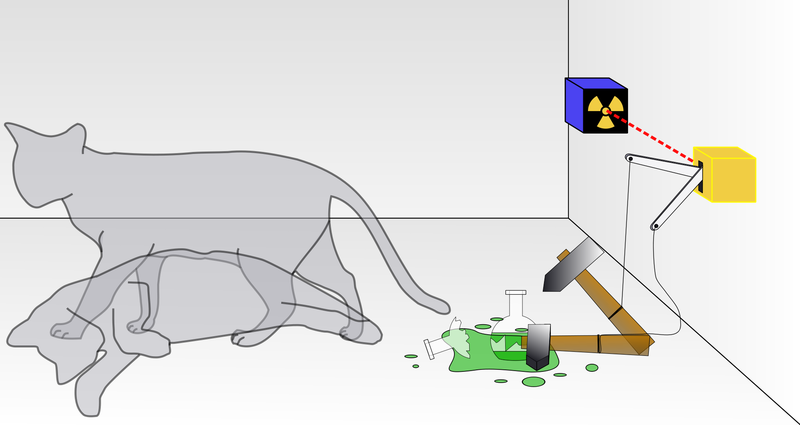 A cat is penned up in a steel chamber, along with the following diabolical device (which must be secured against direct interference by the cat): in a Geiger counter there is a tiny bit of radioactive substance, so small, that perhaps in the course of the hour one of the atoms decays, but also, with equal probability, perhaps none; if it happens, the counter tube discharges and through a relay releases a hammer which shatters a small flask of hydrocyanic acid. If one has left this entire system to itself for an hour, one would say that the cat still lives if meanwhile no atom has decayed. The Psi function of the entire system would express this by having in it the living and dead cat (pardon the expression) mixed or smeared out in equal parts. As usual, the truth is less sensational than the legend. But the truth in this instance can be hard to pin down based on his choice of words and the translation. Confusion begins to fall away by restating Schrödinger’s cat experiment in language that more clearly conveys his meaning (based on historical context and his additional writings). In this way, some of the more important details gain emphasis while the sensational elements loose emphasis. The following interpretive restatement does not increase understanding of what happens at the atomic level, but it will make it easier to explain away the paradox. Based on my quantum wave mechanics, one can set up a ridiculous experiment. Some living organism big enough to see with one’s eyes, a cat for example, is sealed in a box. In the box with the cat is a vial of poison. Also in the container is a sensitive electronic instrument with a few atoms of a radioactive material stored within it. This material is known to have a 50% chance of emitting a particle of light (decaying) within one hour and 50% chance of doing nothing. If the instrument inside the box detects a particle of light coming from the radioactive material, it will send a signal to a mechanical device tripping a hammer; breaking open the vial of poison and killing the cat. The cat, the instrument, and the vial of poison must be configured so that no part can interact and interfere with any other part. One must then completely isolate this entire experiment (system) from the outside world for an hour. During that one hour, common sense dictates that the cat is still alive as long as the radioactive material has not emitted a particle of light. But under the circumstances of this experiment, that is not what the math tells us. The mathematical function (Psi-function, Ψ) for this system would represent the radioactive atoms as being in an indeterminate state, both decayed and not decayed as long as absolutely nothing interferes with the atoms. Any attempt to detect the state of the atoms or the cat, will collapse this indeterminate state into one definite state: decayed or not decayed, alive or dead. But as long as the radioactive atoms remain in superposition, both decayed and not decayed, then any organism whose life is dependent upon the state of the atoms must then be both alive and dead. The state of the radioactive atoms and the state of the cat have become “entangled” with each other. This experiment shows that the mathematical formulas, which we typically restrict to the microscopic world of atoms, can be transferred to the macroscopic world we experience every day, and produce results that defy common sense. This prevents us from naively accepting as valid a “blurred model” of the world—a world in which unobserved things can exist in a blurry state such as decayed and not decayed, alive and dead, here and there, off and on, etc. Maybe we are missing something. There is a difference between a shaky or out-of-focus photograph that is blurry because we have failed to take a good picture of the world, and a steady properly focused one of a blurry world, for example a picture of a cloud or fog bank. Maybe with our current mathematics we have only achieved a blurry picture of the real world, instead of a sharp picture of a blurry world. A blurry world might allow a cat to exist in a state of being alive and dead simultaneously, but I personally do not believe the world is blurry. Schrödinger’s words, understood this way, emphasize his point that physicists in 1935 might still be missing something in their worldview. Even if the equations work, maybe they simply do not produce a clear picture of how the universe truly operates. This is a whole lot less sensational and memorable compared with imagining a cat in a box “smeared out in equal parts” of deadness and aliveness. The most important points are subtle compared to the sensational aspects nonscientific readers tend to focus on. No wonder physicists lean toward heavy use of mathematics. They know that x = 2 is a solution to the equation 1x + 1 = 3 no matter what language a reader speaks. Compared with words, mathematical symbols tend to be highly precise, but they’re not magic. For most everyone who is not a pure mathematician, math is a shortcut for describing or predicting something about the real world. Math carries with it a greater sense of truth and accuracy versus words, which often lead to disagreement over meaning. “The numbers don’t lie,” we tell each other. Or do they? Schrödinger’s imaginary cat experiment draws attention to this question. To me the above equation is mathematical poetry. Read phonetically it says, “H-sigh equals E-sigh.” Mathematicians might refer to it as a Hamiltonian eigenvalue equation, or an equation reflecting conservation of energy, but that doesn’t say much intuitively. To me the equation evokes emotions reflecting truth and beauty in the universe that would require many thousands of words to properly explain. As with poetry, it has elements of ambiguity–it can be interpreted many different ways philosophically that entail different meanings for different people. However, unlike poetry, it is rigorously defined mathematically. Understanding the rigorous mathematical side of H-psi equals E-psi, would help greatly to unravel the mystery surrounding Schrödinger’s cat. However, that is something college students spend several years learning to do. I attempt a basic intuitive explanation in a separate paper, Schrödinger’s Equations. At a minimum we need to know that Ψ is the Greek capital letter psi, (“big psi”). It is the psi-function Schrödinger referred to in his original article introducing his doomed cat. Ψ has no inherent mathematical meaning, but it has become a common symbol for representing a complete mathematical description of the state of a quantum mechanical system. A quantum mechanical system can be a single atom or a subatomic “particle,” or any combination of particles. Particle is a terrible word to use in relation to quantum physics because it has long been known that there actually is NO little solid thing involved…there are only varying densities of energy. It’s just easier for physicists to refer to a very tiny region of space containing very high energy as “a particle.” We refer to these systems as quantum mechanical because they involve discrete units, or packets, of energy called “quanta.” Quanta do not necessarily obey the classical physical mechanics we experience in everyday life. In classical mechanics, we might consider a baseball as a particle—a really big particle. If we throw the ball, we can watch this system follow a predictable path through the sky. With some information and math we can precisely calculate its trajectory. However, in classical mechanics, we never see anything odd such as the same baseball in two places at the same time, or the ball jumping from place to place instantly without existing at any points in between. Our common sense notions of knowing precisely where something is, its direction and speed of travel no longer apply at the small scale of quantum physics. In quantum mechanics, whenever you see Ψ, you know you’re dealing with a quantum mechanical system. Ψ symbolizes all information that is possibly knowable about the system (and necessary for making predictions about its behavior). 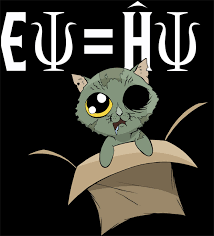 It may be that you start out knowing little or nothing about Ψ, but in the case of Schrödinger’s equation one can input known information such as mass, time and the potential energy field, and then use calculus and algebra to solve for Ψ = [some equation]. That’s why using the symbol like Ψ is so helpful. Getting back to Schrödinger’s cat: A “cat system” would contain on the order of a billion billion billion atoms, (each which can move around in three-dimensional space and be identified by its location using the mathematical coordinates (xn, yn, zn), where n refers to which specific atom one is concerned about. Thus trying to use quantum mechanics to describe the state Ψcat at a particular time t near some point (x,y,z) in the universe would give even the best mathematician a stroke. The total number of variables that must be kept track of just for the location state of the atoms in Schrödinger’s cat would total something like 1,000,000,000,0000,000,000,000,000, 000, 000,00,000,000,000,000,000,000,000,000,000,000,000,000,000,000,000. Some configurations of cat atoms would equate to a live cat, but the vast majority would make up a dead cat. Quantum mechanics doesn’t require us to figure out which possibilities represent a living cat and which represent a dead cat. Schrödinger’s equations suggest that once the experiment starts, all possible states of the cat’s atoms can coexist so long as nothing interacts with the cat or the radioactive atoms. The cat can be characterized as an unobservable combination of alive states and dead states. The cat is in an indefinite state of superposition which can be represented on paper by a graph that looks somewhat like a bell curve. The curve represents the cat spreading out into a wave of cat possibilities. For our purposes here, consider Schrödinger’s equations as the atomic equivalent of Newton’s classical laws of physics. Newton’s laws help a rocket scientist predict where her rocket will be tomorrow (future state) based on when and how she launches it today (current state). But suppose following the rocket’s launch NASA announces: “we’re not sure where the rocket is, but we are 100% certain it’s in two different places.” For a rocket scientist, this would be crazy talk. But for a high energy particle physicist using Schrödinger-like equations, this is not crazy. A subatomic particle can be in two or more places at the same time even though it is impossible to know precisely where those two places are. Experiments and high-tech industrial applications continue to confirm this result over and over again. When Schrödinger looked at the results of his equations he was understandably dismayed. To express his concern he designed his thought experiment to emphasize the strange consequences of his math. His experiment was a colorful way to make a complex point: quantum equations that are accepted as “true” because the math works, should be considered absurd when translated into real world examples. Schrödinger was admitting that the consequences of his math defied common sense. He was not trying to prove a cat could be alive and dead at the same time; he was trying to show that his math was obviously incomplete. In 1935 no one including Einstein could answer why the world we experience every day does not reflect the world we observe at the tiniest of scales in the laboratory. Einstein died unresolved about this paradox. He hated the indefiniteness of the quantum theory he himself helped create. Science must be missing something! Science was missing something alright, but it turned out it wasn’t in the math. In 1964 scientist John Bell showed that Schrödinger’s picture of the world appeared to be a sharp picture of a blurry world, just as Schrödinger’s equations predicted. Bell used a statistical theorem, later confirmed in multiple experiments by French physicist, Alain Aspect, to show that Schrödinger’s equations were a complete description of what happens at the local atomic level. [ii] According to Bell’s proof, there was nothing hidden in nature locally that, if known, would determine in advance if Schrödinger’s cat would be dead or alive before it is observed. But “locally,” in his proof, meant something on a grand cosmic scale. “Locality” has a very specific meaning in science. According to Einstein’s Theory of Special Relativity, if an observer sees, for example, two distant events—one on the sun and the other on earth—and they appear to occur at the same time, then it is impossible that either event caused the other. The two events are nonlocal. This is because on average nothing can travel faster than light through a vacuum. Since light takes about 8 minutes to travel between sun and earth, any event on the earth cannot possibly influence anything on the sun in under 8 minutes, (or vice versa). Yet according to Bell’s math, (repeatedly confirmed by physical experiments), it is indeed possible to set up an experiment in which measuring some characteristic of a particle can instantly dictate that same characteristic in another particle located miles or even millions of miles away. Einstein had long before recognized himself that the quantum mechanics he helped pioneer implied the possibility of such nonlocal effects. He called it “spooky action at a distance.” Einstein hated spooky action at a distance, and so did Schrödinger. But that’s the great thing about the scientific method. Accepted theories (theories that “work”) can be limited or extended based on new thinking or new experimental results. This in turns spurs even more thinking and research leading to deeper understandings of the universe. In this case, Bell showed that Schrödinger’s math was not missing any mathematical variable that if known, would explain away spooky action at a distance. The only thing missing was our understanding of what goes on at the microscopic scale of atoms. So, in 1964 it remained theoretically possible that Schrödinger’s cat could be put into an alive and dead state correlated with radioactive atoms that are simultaneously decayed and not decayed. Once “entangled” this way (by the set-up of the experiment) we would be forced to characterize the cat as both dead and alive as long as the state of the radioactive atoms, or the cat, remained indefinite. According to Schrödinger, this uncertainty could be instantly resolved by direct observation of the atoms, or the cat. Since 1964 though, the scientific legend and the actual science behind Schrödinger’s cat have taken different paths. The reasons have to do with the problems of language and, in the end, the very nature of information. Ironically, the nature of information is both the reason the legend lives on and the answer that solves the paradox. Information is the problem and the solution. For the moment, I will turn away from the math and focus on the relationship between information and language and its effect on the legend of Schrödinger’s cat. Redundancy is why teenagers can read each other’s cryptic text messages, and spouses can read each other’s shopping lists. U cn rmv a lot o lttrs n still rd the mssg. Our brains are able to fill in the blanks and interpret the basic meaning intended by the sender. Human language has evolved to be better at quickly transmitting general meaning rather than precise meaning. To our prehistoric brothers and sisters, the ability to quickly send and accurately receive a message such as, “something deadly is hiding in that bush,” was a lot more important than knowing the exact mass, position, and potential velocity of a hungry tiger crouching nearby. The more redundant communication is, the less chance for error in understanding the meaning of a message when it is received. To make a message more precise though, one must accurately cram more information into the same signal, or take a longer time to transmit and receive the more precise information. Humans are limited in the amount of information they can, on average, comfortably cram into a few sentences and body gestures. There is often no option in survival for taking extra time to send a precise message. Redundancy in language helps solve a survival problem. It enables humans to communicate with each other quickly in a reasonably error-free way despite surrounding noise and activity, and despite variations in voice, volume, vocabulary, and body language. I doubt Schrödinger was overly concerned with these problems of ambiguity, vagueness and redundancy in language when he proposed his thought experiment. He was writing for fellow scientists. Any ambiguous words he used were probably chosen without fear his audience would select the incorrect meaning. His conscious or unconscious choice of ambiguous and vague words took advantage of their lack of precision. He was able to convey multiple possible meanings about things that do not have easily measurable boundaries—a communication task for which mathematical equations are ill suited. Take for instance the word “observe.” That will be the most important word for unraveling the paradox of Schrödinger’s cat. To the average person it means “see.” But in science, observation is both ambiguous and vague. Observation is ambiguous in this case because its meaning can include, “detect,” “measure,” or “receive information.” Beyond its multiple meanings, the word observation is also vague. The boundary between observing and not-observing can be difficult to identify or quantify. Does observation require human consciousness, or is “cat consciousness” enough? Do you have to observe something in real time for it to meet the definition of “direct observation,” or can you observe an event on a computer monitor that displays a slightly delayed image coming from a remote camera? Schrödinger wasn’t trying to answer these difficult questions; his use of the term observation left in tact both the breadth and indefiniteness of its meaning while allowing him to zero in on the consequences of quantum indeterminacy and quantum entanglement, which was the subject of his thought experiment. With 100% certainty, Schrödinger knew that an observation, no matter how we might define it, would generate enough interference with a system in superposition of possibilities that it would collapse the superposition into one definite reality. When theoretical physicists read Schrödinger’s cat experiment they were able to translate his words back into thoughts in a way that is much closer to Schrödinger’s intended meanings. Unfortunately, because Schrödinger’s thought experiment contained aspects that can be perceived as sensational, the potential for spawning a scientific legend was unusually large, even amongst other physicists. Consciousness can certainly entail physical actions. Humans process incoming sensory information about physical reality through both conscious and unconscious brain activity, which then allows us to participate in new realties through our own physical actions. Consciousness may be the wizard behind the curtain, but it is only manipulating reality, not creating it. Water makes a better analogy for understanding emergent properties. A chemist studying the properties of a water molecule would not be able to predict that in groups of billons they would at one temperature lock together in a crystalline structure, at another flow, and at yet another fly apart into vapor. No magic, just emergent properties of a complex system that is extremely difficult to predict or understand by looking only at the individual atoms or molecules. With developing knowledge about emergence, science has moved in the direction of removing any need for a conscious observer in defining reality. Consciousness is, of course, necessary for perceiving and interpreting events, but not for creating underlying reality. Quantum mechanics, however, is not to be mistaken for something real; it is itself an abstract construct of human consciousness. At its core, quantum mechanics is a set of rules describing constraints the universe places on what we can perceive as “real.” These rules help us approximate reality at scales too small and too fast for us to directly experience. Sorting that out in more detail is an issue for philosophers as well as scientists. So, if the conscious curiosity to look in the box is no longer required to kill Schrödinger’s cat, what is required? To answer this, let’s break down observation into smaller processes. An observation requires distinguishing between possible states of a system. Is it light outside or dark? Is it hot in here or cold? Is the electron I’m measuring spin up or down? Did the photon I just detect have right-handed circular polarization or left-handed? To make such observations one must not only receive information, but be aware of receiving the information and have the ability to interpret it. At what point then, during the process of observation, does reality exist? To me, a logical place to start would be the earliest point in the process: that infinitesimal period of time when “information” begins to flow from an event to an observer (no faster than the speed of light). Anyone who has used a digital cell phone has experienced the transition from a clear conversation to one that is unintelligible. Despite redundancy in human language, at some point when enough snippets of sound are dropped, we no longer understand the conversation. We might say we are no longer receiving information. But that’s only true at one scale. For example, at the scale of communicating messages we are no longer receiving enough information to distinguish sentences that mean anything to us. Yet we may recognize an individual word now and again, and that is information. What about when the call is completely dropped? We still have information. We know that we are no longer talking to our friend—that is information. We also know that our friend is somewhere else at a distance further than a voice can carry through air —that is information. At what point do we have zero information? The easy answer might be when we’re dead. But even then we will still carry information to our grave. A medical official will observe our body will know we are dead—that is information. A paleontologist thousands of years in the future might uncover our remains and determine our gender, age, what we last ate, and the approximate year we died—so our remains still contain information. There is a difference between receiving or carrying information and understanding information. We often receive and carry information we don’t understand. We also interact with information below the level of consciousness. We are even unaware of the extent of our own lack of understanding about the information we receive and carry. What if we take the perspective of a Zen master and think of the word “information” as a signpost pointing us in the direction of a concept that cannot be reduced to a simpler set of concepts? According to Claude Shannon, the pioneer of “Information Theory,” this might not be far off. To Shannon and other information theorists, information exists in and of itself. Information is information. He considered information intuitively as “the answer to a question.” We measure answers in “bits.” The minimum amount of information is one bit. Think of the minimum amount of information as being either yes or no. One bit with value 1 = yes and 0 = no. According to some scientists, information is nothing more than “changes in heat.” All information, it is proposed, can be traced back to transfers of heat from one place to another. Sorting out these definitions here would take us deep into information theory, thermodynamics and entropy. For this paper, let’s assume that when two or more systems interact, information exists to the extent that the state of each system depends upon the states of the other systems. Information entails entanglement between multiple systems. Whatever the information is that “exists,” we as humans, can measure it with some finite number of yes/no bits. With this definition, an interesting opposite comes to mind: whenever two particles (in known states) interact such that it becomes physically and theoretically impossible to determine their previous states, then information has been “erased.” It is widely thought among scientists that information, like energy, can never be destroyed, it can only be mixed up and spread out so much as to be, in practical terms, erased. Erasing information most often means conversion of information, in whatever form it exists, into heat energy radiated away such that the process is too complicated to reverse. In physics such things as “quantum erasers” have been demonstrated. To resolve the Schrödinger’s cat paradox, however, we only need to focus on information that has not been erased. Let’s look at information in the form of light particles entering our eyes that have been reflected from some physical object. Reflection like this involves an interaction between light particles and matter, which occurred (in the past) before such light entered our eyes (the present). The reflected light photons are “observable” whether or not our eyes are there to capture them. This is a situation in which information exists on a very fundamental level with or without a conscious observer present. Suppose I happen to be in the path of light particles reflecting off of a leaf. Some of the light particles may pass through the lenses of my eyes and form a pattern on my retinas. My brain translates the pattern of light hitting my retinas into an image in my mind. When a certain pattern of light particles with similar energy levels (color) hits my retina, I see for example a green leaf. However, if anything in between interacts with too many of the particles entering my eye, at some point, I will no longer be able to interpret the pattern as a green leaf. If I’m looking through a Coke bottle, I may no longer see any pattern that I recognize. Does that mean that the leaf doesn’t exist? No. Does that mean that the information about the leaf carried by the light particles is destroyed? No. It simply means the information has been spread out in so many different directions by scattering or reflecting off the Coke bottle that I can no longer recognize a leaf. The information has scattered into the environment in a way that is too complicated for my brain to recognize as a leaf. In other words, there is not enough coherent information available for me to make an accurate interpretation, but the information exists nonetheless. Where does this leave us? Let us recap what we know and do not know. We know that atoms and at least some molecules can be put into a superposition of states. We know that if we observe measure, detect, or otherwise interfere with a superposition in any way, we will find only one of the possible states actually existing. The superposition is said to “collapse” into a single state. What we can never predict with 100% certainty is which of the possible states we will find. Schrödinger, despite his loose language, was aware of all of the above. To deal with this he relied on isolating the cat from both the observer and the radioactive device connected to the vial of poison. The purpose of the steel chamber was to prevent information about the cat from leaking out to the observer thus causing the state of the cat to collapse into either dead or alive. I suppose Schrödinger knew that shielding the observer from the cat with a box of steel makes no difference as to whether the superposition of the cat exists or not. He simply used the steel box to represent “complete isolation” from the environment, without knowing or defining exactly what is required to achieve complete isolation. Schrödinger, as a theoretician, knew that complete isolation in principal would allow a superposition to evolve, but he was unconcerned about the practical limitations of achieving this experimentally. In his day, Schrödinger didn’t even have a rigorous way of describing a completely isolated space. Oddly, Schrödinger and Einstein knew a Dutch mathematician named William de Sitter who made contributions to understanding curvature in the universe (de Sitter Space and the de Sitter Universe). However, had any of them lived until 1997 they might have read the work of physicist Juan Maldacena who popularized a space-time geometry he called, “Anti de Sitter space.” If so, then Schrödinger might have used this concept in his thought experiment. Anti de Sitter space is a mathematical concept that rigorously describes a space (or for our purposes, a container) completely and utterly cut off from communication with any other space. Objects in anti de Sitter space are truly isolated. A cat stuck in an “anti de Sitter” space that is contained in a box would never, ever radiate information to the walls of the box, or the outside world. Anti de Sitter space is not observed anywhere in our universe. We seem to live in a “de Sitter universe” that is forever expanding outward and with it, all information is flowing as well. But at least in a thought experiment a scientist could say with a straight face using rigorous mathematics that any experiment contained in an anti de Sitter space could never radiate information outside its boundary. Such a thought experiment could then proceed without mathematical contradiction. In any case, a superposition of cat states cannot exist inside a universe if detectable information on either the state of the cat or the radioactive atoms is flowing for any period of time no matter how infinitesimally short. Unfortunately we can never precisely pinpoint the instant that such information begins to flow. This is described by another aspect of the Heisenberg Uncertainty Principal: the time-energy uncertainty relation. Although too involved to fully describe here, this principal tells us the limits of how precisely we can measure an interval of time. We can always measure that an event happened during some reasonable interval of time, but we cannot say with certainty that the even happened at a certain point in time. The more precisely we measure time, the more energy we must use in the measurement process, and unfortunately, there is only so much energy we can tap in the universe. And anyway, if we confine too much energy in certain place, it will start to warp the space around it and cause changes to the very thing we are trying to measure. However, given current technology we can easily get within millionths or billionths of a second of knowing “when” an event has occurred with respect to some clock. Decoherence is a theory of how superpositions rapidly spread out into the surrounding environment and become too complicated to detect or reverse. The basic idea is that it is extremely difficult to maintain a superposition because even in the vacuum of interstellar space where there is zero average energy, particles such as virtual (undetectable) photons and pairs of electrons and positrons wink into and out of existence and can spontaneously interact with objects that are in superposition. Consider electron and positron pairs. Respectively, they have exactly opposite properties, so when you add them together you get zero energy, zero momentum, zero everything. If you really want to bend your mind, you must delve into Einstein relativity, which when combined with quantum mechanics demands mathematically that we accept the positron as indistinguishable from an electron moving backwards in time. How you see such a particle depends, like everything in relativity, on how fast you are moving relative to a particle interaction. One man’s electron moving backwards in time is another’s positron moving forward in time and no one has the right to say which one is “the truth” because such an absolute truth does not exist anywhere or at any time. Regardless of how an observer might be moving, there is at least some probability to measure any amount of energy (theoretically up to infinity) popping into existence for an incomprehensibly brief moment in the neighborhood of any particle system under study. This is something Schrodinger did not know; it would be decades before the vacuum energy phenomena was recognized and studied. We must accept that there are infinite possibilities for any system to interact with these ghostly particles and become entangled. Unfortunately, we cannot predict exactly how or when such entanglement will happen, or whether it will be strong enough to interfere with a particular superposition. We cannot make such predictions because the interactions happen within some interval of time and some range of energies that are uncertain. They are not uncertain due to lack of information, they are absolutely uncertain in the sense that the universe limits certainty in ways mathematically calculable following from the Heisenberg Uncertainty Principal. As mentioned above, due to energy-time uncertainty, the greater the individual energies of particles popping into existence, the faster they must annihilate out of existence so that average energy remains zero and the rules of nature described in the Heisenberg Uncertainty Principal are not violated. If entanglement with the “environment” does occur (which is highly likely to happen), then we can say the entanglement encodes within each system at least some information on the state of the other system or systems. Here on earth, this task is far more difficult than in the vacuum of deep space. An object put into superposition must be isolated from molecules or atoms in its surrounding atmosphere that could interact with it and start the process of information flowing into the environment. Even if no particles interact with the system, the object must be cooled to near absolute zero to reduce the chance of it spontaneously emitting infrared light that could be absorbed by a nearby particle transferring energy to it and thus “announcing” the emitting object’s location and energy state. Spontaneously emitted infrared light is what night vision goggles depend upon to create an image out of what humans naturally perceive as the blackness of night. Night vision goggles work on the fact that all objects above absolute zero temperature have excess energy that will escape in the form of light, (which we might perceive as heat with our skin but which at low temperatures is invisible to our naked eyes.) Since no object in the universe can ever be cooled to absolute zero (another aspect of the Heisenberg Uncertainty Principal), it is absolute that every object (besides dark matter) has some probability to spit out some wavelength of light. (To avoid hate mail, I should probably say, every perturbation of a gauge field has some probability to spit out a gauge boson, but don’t worry about that if you’re not a hater.) Again, an escaping photon absorbed by another particle in the universe will reveal some information about the state of the object it came from, but it makes no difference if there are night vision goggles there to see it or not. At a certain critical point, which scientists have yet to properly understand, enough physical information exists about an object that no amount of energy or technology can reverse the process of the object transitioning from the domain of possibility into the range of reality. Superposition of possibilities cannot survive past the critical point of irreversibility. If it could, then the configuration of atoms in a dead cat could spontaneously or with applied energy and technology, reverse into a configuration of a live cat. According to some interpretations of decoherence theory, it is possible that the superposition (wave function Ψ) only appears to collapse for all observers sharing the environment into which information is dissipating. As the information dissipates, it becomes entangled with everything in its surrounding “environment” creating a giant combined superposition. This is why, theoretically, if you could contain 100% of the information about the cat inside some type of vault, the wave function might collapse only for observers inside the vault, but not those outside of it. One could return to the idea of anti de Sitter space. Everyone inside an anti de Sitter container would share a single reality, whereas for observers outside the container, all possibilities still exist simultaneously. Professor Leonard Susskind of Stanford University used this idea in 1993 to describe a concept he coined as “Black hole complementarity.” His purpose was to discredit Stephen Hawking’s support for the idea that information is forever lost when an object falls into a black hole. In the process, Susskind essentially showed that two truths can exist about any object that falls into a black hole, but unfortunately no one can ever observe both truths simultaneously. To an observer outside the black hole, an object falling into it is blasted apart by high energy photons; the atoms of the object then spreading out over the entire spherical horizon of the black hole. Conversely, an observer on the inside would see the object float through the boundary as if nothing had happened. Once again, a situation in which no one can lay claim to the absolute truth. An analogy might help in understanding the idea of information dissipating into the environment. Imagine you are at an airline gate waiting for a flight. You are the “observer” and you want to figure out which passenger was sitting in each seat, but you have no way to see inside the plane, and you do not have access to the computer system that tracks seat assignments. The plane pulls into the gate and everyone has to get off the plane through the front door. There is one aisle and one door, so only a few people can exit at a time. As people jostle (interact) with one another the information about their seating order starts to dissipate into the environment immediately. Even though information is starting to get away, standing there inside the terminal you might reasonably determine that the first person off the plane was sitting in the front row of the plane. Out of 134 seats on the plane there are only four seats in the front row. So you would have a 1 in 4 chance of guessing which seat the first passenger was sitting in. If you could keep track of the order each person exits the plane, or quickly poll each passenger, “Which seat were you sitting in?” you’d probably gain an even more accurate picture of the seating order. No matter how you detected information flowing out of the plane you’d have a much better chance than the 1 in 134 chance of simply guessing which seat any specific passenger was located in. Notice, though, how your certainty starts decreasing rapidly after the plane empties and passengers begin walking into the terminal. They’re moving in different directions, some interacting with each other, some with others in the terminal. Some are walking fast, some slow. Within a few minutes, trying to reconstruct who was sitting where would become an extremely difficult task. What about a few days later? That would start approaching practically impossible. The information still exists. If you could find each passenger they might remember their seat, or have a copy of their eticket on a server somewhere like Google’s Gmail. But imagine the time, energy and cost that would be required to reconstruct where people were sitting? Soon paper tickets would find their way into landfill, etickets would be erased, people would forget where they were sitting, and computer databases would get erased (with data converted to heat). No information would be technically destroyed. However, it has clearly dissipated beyond all recognition. It would functionally be impossible to ever put back the information—it would be like trying to reconstruct a vase shattered on cement floor and swept into the garbage. So, if interactions start the process of decoherence, how “small” can an interaction can be and still cause a superposition of possibilities to become reality? That question has not been completely answered, but scientists have proven that even a single electron can function as an observer and destroy a superposition. In November 2007, a team of researches from the Department of Energy’s Lawrence Berkeley National Laboratory; The University of Frankfurt, Germany; Kansas State University; and Auburn University published the results of experiments showing the collapse of a fast moving electron’s superposition based on an extraordinarily tiny interaction with a slower moving electron. The two electrons were former “partners” simultaneously knocked out of a single hydrogen molecule. But, don’t imagine two electrons bumping into each other because that isn’t required. All that was needed was a certain level of interaction between the tiny electromagnetic fields emanating from each of the departing electrons. In the early part of the experiment, the slow moving electron did not have enough energy to interact with its fast moving electron partner. As a result, between the time the fast moving electron left the hydrogen molecule and the time it hit a detector, it was completely isolated from its environment in the same way Schrödinger meant for his cat to be isolated: it did not interact with any other particles in the universe. With no information existing about the fast moving electron’s position, its “possibility wave” Ψ was able to spread out in space. As it did so, this unobservable wave bounced off of the hydrogen atom’s two protons that were themselves beginning to fly apart. The protons, in essence, played the role of the world’s smallest rocks sticking out of the world’s smallest ocean. The ocean makes a good analogy: A long straight wave moving towards a shore that encounters two rocks jutting up from the sea floor will bend around the rocks. Once bent at different angles, the wave will start interfering with itself on the other side of the rocks before hitting the shore. In the case of the hydrogen atom in the above experiment, the two protons in the nucleus caused the electron’s “possibility wave” Ψ to bend at different angles as it passed around and between them. The wave then interfered with itself on the other side as it approached the smallest sea shore in the world—a very sensitive electron detector. As a result of wave interference, there were certain places on the detector for which Schrödinger’s wave equation would predict zero chance of ever finding the fast electron. And that’s exactly what the experiment confirmed. The only way the fast electron could avoid certain regions of the detector is if different parts of the wave cancelled each other out the same way an ocean wave crest meeting an ocean wave trough will flatten the water out at the place they come together. It is commonly understood that an “unobserved” electron takes all possible paths simultaneously as it moves from point A to point B the way a wave approaching the shore. But if there is an object that interferes with the wave, it will not hit the shore evenly at every point or move up onto the sand the same distance. Imagine an “ocean detector” at the sea shore. Some parts of the wave might reach the detector and other parts not, even though it is one wave connected wave. An observer not seeing the water but only the data from the detector could determine that there must have been interference since he launched a smooth wave towards the detector but ended up with only blotchy readings at the detector. In the case of the electron experiment, the researchers next attempted to convert the slow moving electron into the world’s smallest observer. If the slow electron could be coaxed into interacting with its fast moving partner, then it would be carrying information about the position of its partner. And, as we’ve been discussing, at a critical point after information about a particle in superposition exists, the superposition collapses into a particle with one definite reality. To accomplish their goal, the researchers gave the slow moving electron a little energy kick via an externally applied magnetic field. By doing this, they were able to force the fast and slow moving electrons to interact. This type of interaction is a Coulomb interaction. It relates to the fact that a moving charged particle creates an electromagnetic field around itself that will generate a force on any particle that gets close enough. In this case, the interaction altered the trajectory of the slow moving particle such that researchers could deduce mathematically what path the fast electron was taking towards the detector. This is called “path information,” and no superposition of locations can survive if path information has been registered on the surrounding environment. The difference between interacting and not interacting came down to a level of energy somewhere between 5 and 25 eV (electron volts). The slow moving electron without any kick carried about 5 eV of energy; too low to interact with the fast electron. All that was needed was an extra 5 to 25 eV jolt to the slow electron to apparently collapse the possibility wave of the fast electron. To understand how tiny this amount of energy is, sit quietly for one second. You just burned off approximately 624,150,636,309,000,000,000 electron volts of heat energy. Now try to imagine how little energy 25eV represents. The end result is that a superposition can be destroyed by an interaction involving only fundamental particles that are themselves microscopic. No consciousness or other human intervention required. And this process of decoherence from possibility to reality occurs over a time period so brief as to have no meaning at the scale of normal human activity. The point of of time just beyond irreversibility is the time when reality is born. It is not an instantaneous process, but certainly one that, without the aid of instruments and computers, we perceive as instantaneous. Theorists have suggested that a microscopic particle of dust, for example, that evolves into a superposition of states while floating in the vacuum of interstellar space will on average decohere into a definite state in one millionth of a second. How long do you suppose a cat could do that for? Consider it functionally as not ever. Easy enough to say, but the implication is that a different universe lies behind the horizon of a black hole. Some physicists, such as Lee Smolin at Canada’s Perimeter Institute, have written papers on the idea of baby universes being born on the other side of black holes. What is interesting to me is that if a different universe lies inside every black hole, then it is possible to be “outside our universe.” This is in disagreement with science and philosophy that convincingly argues that there is no “outside” to our universe. Imagine an astronaut who drifts in free-fall across the point of no return of a massive black hole. Such a lucky (or unlucky) space traveler will notice nothing unusual, but this individual could look back and observe the universe just departed. Now assume the astronaut has a colleague remaining just outside the black hole. She would see the image of her counterpart literally turning red and ultimately shifting into invisible infrared light and beyond, the image fading into infinite oblivion as it spreads across the entire surface of the black hole. The information would never be destroyed, it would simple change form. Depending on the size and age of the black hole, at some point, which could be an infinitesimally short, or eternally long period of time, “information” about the astronaut would be radiated out of the black hole thus assuring us that information is never destroyed. The astronaut inside the black hole would vehemently argue, “no, I have not spread out over the surface of the black hole and been radiated back to where I came from, I’m right here.” We must accept this duality of “truth.” No matter how advance communication technology might become, whether the astronaut outside the black hole stays there or chooses to drift into the black hole, the two space travelers will never EVER be able to communicate with each other and disagree on what happened. Not practically and not in principal. Never. We drifted very far (conceptually) from Schrödinger’s cat in a box back on earth, but it’s all connected. To be thorough, we must consider some far out version of the experiment in which Schrödinger’s cat is alive inside a black hole and dead outside. To remain consistent, we must believe that no observer or combination of observers inside or outside a black hole could legitimately disagree on whether the Schrödinger’s cat is alive or dead. We can safely conclude, based on the most current understanding of the universe, that there is no situation in which we would ever observe a dead-alive cat. In all of the discussions of the Schrodinger’s cat experiment, the one discussion I’ve never seen is one that turns on the definition of “alive.” Intuitively we know that dead and alive are mutually exclusive. But where is the line between them? What about a cat that is brain dead but physically still alive? If a cat’s heart stops but it remains “cat conscious” for a short period of time, is that alive or dead? Most would call it, “dying.” So in Schrödinger’s experiment, looking in the box, might an observer at a particular instant see a cat that looks dead but is actually still alive or a cat that looks alive but is actually dead or dying? A snapshot of the state of the cat’s individual atoms, frozen in time, does not necessarily tell us if the cat is alive or dead in that instant. I think we should consider “alive” to be an emergent property of biological interactions. I know of no properties of a set of atoms we can observe or measure that would reveal whether a large system of atoms is alive or not. Yet in vast quantities, we know complex interactions between atoms underlie “life.” We also know that whenever particles interact, information exists and flows into the surrounding environment. If the information that is flowing can, in principal, answer the question: “Is the cat alive or dead?” then it makes ZERO difference whether anyone is there to receive that information. If information about the set of states that describe “alive” exists, and is irreversible, the there cannot be a superposition of possible states. Since the state of being alive only results from a massively complex set of interactions, we must accept that information must be flowing during any time interval one can measure down to some time scale so brief that the time-energy uncertainty relation dictates we cannot precisely know the state of the cat. At some point we have to worry that the energy we must harness to measure the cat’s state during a brief time exceeds all of the energy available to us in the universe. Under this definition, information on the state of the cat atoms exists at all measureable timescales. Some states correspond to an alive cat, some to a dead cat, and others to a dying cat. But, there is no state of the atoms that is both alive and dead long enough to actually measure. The constant flow of information means the cat must be in one possible, but definite, state at all times, whether alive or dead. From a scientific point of view, let us say that dead means that no amount of effort (energy) can make the organism alive again regardless of any reasonable definition of alive. One way to look at this is from the point of entropy. Entropy is a measure of the likelihood of finding a system in a particular state amongst all possible states. A system with high entropy is one that is in a highly probable state. If the system in question is a cat, then just in terms of location, there are on the order of 1880 possible location states of the system of atoms making up the cat. The vast majority of states (which approach infinity) equal a dead cat. Being alive represents only a tiny fraction of the possible states of all atoms making up the cat. Any small subset of probable states forms a group of “improbable states.” An object in an improbable state by definition will have a low measure of entropy. Thus a living cat is a cat with VERY low entropy. A dead cat, with all its atoms dispersing randomly into the universe, is a cat with extremely high entropy. If we cut off a cat’s oxygen its entropy will start increasing. At some critical level of entropy, the cat will be dead. Just prior to that point, the cat might not be breathing, but by adding oxygen (energy), the cat’s entropy can reverse, taking it back to one of the states of being alive. Once the cat is beyond a critical point of entropy, it will be dead forever no matter how much energy is consumed trying to resuscitate it. The fluctuation and flowing of information prevents the possibility of the cat EVER being in a superposition of possible states above and below the critical “death point” Sc. In any case, observing a cat oscillating back and forth around the point of death would likely be indistinguishable from a cat whose atoms are in an infinitesimally brief state of superposition of alive and dead. Upon set up of the experiment, Schrödinger’s cat is either alive because the scientist failed to remove the atmosphere in the box and cool it down near absolute zero degrees Kelvin, (-497.67° F), or the cat is a dead frozen mess in a vacuum container. If the scientist turns on the experiment with a warm living cat, then massive amounts of information about the cat’s state of existence is flowing from the cat, including infrared energy interacting with the walls of the box which in turn are interacting with the surrounding environment outside the box. Information about this cat is also interfering with the instruments connected to the radioactive atoms. The scientist may be ignorant of the state of the cat and the atoms, but the universe is not, and that is what really matters. In fact, the existence of the cat functions as a macroscopic amplifier of the state of the atoms preventing them from maintaining a superposition that they could indeed enter in a more controlled laboratory setup. Instead of the superposition of the atoms putting the cat into macroscopic superposition, the hot dense cat operates to prevent the atoms from ever entering a superposition of decayed and not decayed. That would have been a more interesting story: how a cat can control the process of atomic decay. Sorry to say, no dead and alive cat. Schrödinger never doubted this result, but his doubt seems so far to have been for the wrong reason. His hope that his own theory would be proven incomplete has never been realized. It still looks today that we live in a universe that is blurry at its most fundamental level.